The story behind the images. My photographic journey is taking me in a new direction these days. I am focusing on incorporating the “elements of design and composition” in my work transforming the way that I approach images from capturing moments-in-time (“left brain”) to works of art (“right brain”). The “left brain” sees a basketball. The “right brain” sees an orange ball with sunlight hitting it at a slight angle creating a shadow. The images presented in this exhibit were taken during recent trips and incorporate the various design elements such as color, texture, light, shadow, perspective, lines, and patterns. 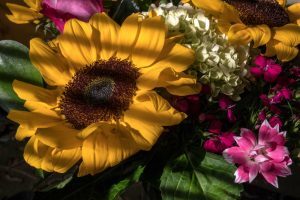 Instead of taking a picture of a doorway or a flower or a landscape, I present a bouquet of yellow, white, and green shapes (flowers) accented by bars of sun and shadow; or a shaft of light exposing the shapes and bright colors of fruit in an outdoor market. The challenge is to hold the viewer’s interest for at least 6 seconds per image. I have been studying with Joe Baraban (www.joebaraban.com) over the last several years. Joe is helping me develop my artistic sense and perspective as represented in these images. I hope you enjoy them. Manarola, Cinque Terre, Italy – September 2014 – Canon 5DMKII; Canon 17mm-40mm lens @ 21mm; ISO 100; F8 @ 1/200. My wife Joyce attended a business meeting many years ago in Rapallo, Italy. I could have joined her on the trip for only the cost of airfare but did not go because of job commitments. 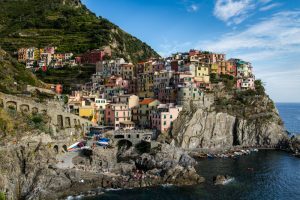 While on her business trip, she walked the 5 towns of Cinque Terre on the rocky coast of Italy. We always talked about how much of a mistake it was for me to stay home and we vowed to make the trip back, which we did in the fall of 2014. I researched the 5 towns before arriving. 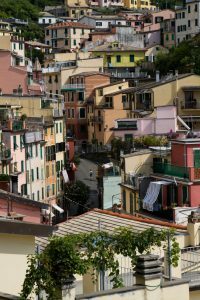 My goal in this photograph was to capture the beauty and slender of this old city hanging in the balance on the edge of the Mediterranean‘s Gulf of Genoa. I was drawn to the shapes and colors of the buildings and the way that the sun bounced and highlighted the buildings popping the colors and creating shadows. We walked up the side of a hill, escaping a boat load of tourists (litterally) to capture this image. Asticou Garden, Northeast Harbor, ME – September 2016 – Panasonic DMC – ZS100; zoomed to 84.4mm; ISO 125; F5.9 @ 1/250. This beautiful garden is near Bar Harbor, ME and is full of wonderful plants, flowers and butterflies. As the sun was beginning to set, shafts of light moved between the flowers very quickly. 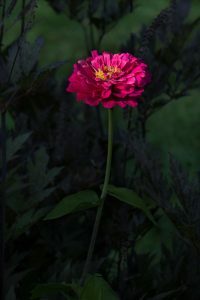 I noticed that at times it would light up an individual flower for a few seconds and then move on. There was not much time to react. So I chased the light through the garden as it danced through a particular flower bed and voila! Bass Harbor Lighthouse, ME – September 2012 (seems like yesterday) – Canon 5DMKII; Canon 70mm-200mm lens @ 75mm; ISO 100; F22 @ 2s; on a tripod. Joyce and I were on a motorcycle trip to Bar Harbor, ME. 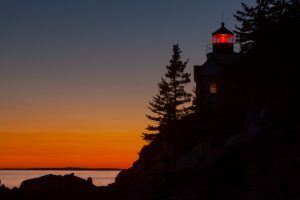 After doing some research we decided to view and photograph the sunset at Bass Harbor. In full motorcycle garb carrying camera gear and a tripod, we descended the stairs and then climbed down on to the rocks to set up, compose, and wait. There were lots of people there to view the sunset and they were pretty much in the way of getting a nice photo. But, the best time to photograph a sunset is after the sun sinks in to the horizon. When that happened all that were left were a few “real” photographers who know that the best time to shoot a sunset is during the “blue hour”-about 30 – 40 minutes after the sun sinks below the horizon. The image exhibited is the very last in the series that was captured that evening. I timed the red light in the lighthouse to make sure that it was lit in the photograph. The climb back up the rocks and stairs were a bit tricky in the dark and the mosquitos were ferocious when the sun went down. But it was all well worth it. Portofino, Italy – September 2014 – Canon 5DMKII; Canon 24mm-105mm lens @ 24mm; ISO 800; F8 @ 1/100. Portofino can be “touristy”. When that happens, Joyce and I wander around until we find interesting places where no one else is going. 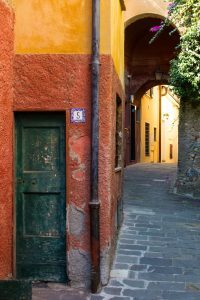 We found very colorful and interesting passageways, doors, and designs in the architecture of the buildings. After visiting the Parrocchia di San Martino church, we discovered this passageway next to the church. Many elements of design and composition are exhibited in this photograph. Color, texture, leading lines, light and shadow. I wonder what is behind the green door? Where does the passageway lead to? 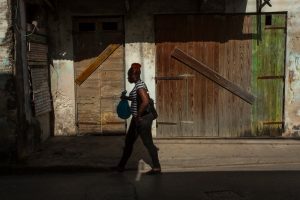 Speightstown, Barbados – February 2016 – Canon 5DMKII; Canon 17mm-40mm lens @ 40mm; ISO 100; F16 @ 1/200. It was just one of those days. I was bit rattled because driving in Barbados is always a challenge. You drive from the wrong side of the car, on the wrong side of the road; the roads are narrow and bumpy; many of the locals drive bigger SUVs; and everyone that you are not from around those parts because the license plate sticks out like a sore thumb announcing that the car is a rental. And, to top it off, when I arrived it was a bright, bright sun shiny day-not great for photographs. That’s when I heard my mentor Joe Baraban (www.joebaraban.com) whispering in my ear: “Take out your artist pallet. What are the elements of design that are available to you? How about a Figure Ground photograph?” Figure Ground Relationship (Gestalt Psychology principle) is a clear distinction between figure (subject) and ground (background). A light figure on a dark background, or a dark figure on a light background. Photographer Henri Cartier-Bresson is known for this style of photography. So, as I was walking down one of the side streets, I noticed an old boarded up church next to a wonderful bakery. The sun was bright creating distinct, sharp shadows. I also noticed a very light colored section between 2 of the boarded up doors. AHA! A Figure Ground possibility. I switched my camera to all manual, set up the shot and pre-focused on a spot on the sidewalk, and waited. After a while, a woman walked out of the bakery and I clicked the shutter. 1 – shot. Perfect Figure Ground. I did stop in the bakery afterward and just had to try one of the pastries. The drive back was much more enjoyable. Camden Harbor, ME – August 2016 – Canon 5DMKII; Canon 70mm-200mm lens @ 70mm; ISO 400; F8 @ 1/80. I attended a photography workshop lead by Joe Baraban (www.joebaraban.com) in the summer of 2016. On one of the first mornings, I got up nice and early to shoot the morning sunrise from the Camden Harbor vantage point. I was told that as the sun comes up, the steeple of the church in downtown Camden slowly illuminates first which should create opportunities to make interesting images contrasting light with shadows and reflections. Best laid plans… a big cloud bank blew in at the least opportune time and blocked the sun as it came up. So, I was not able to get the shot I was hoping for. I then took out my artist pallet and began walking around looking for reflections in the water. The Schooner Surprise was docked for engine work and when the clouds broke, there was a beautiful reflection of color, shapes and lines in the water. Erice, Sicily – May 2016 – Canon 5DMKII; Canon 24mm-105mm lens @ 88mm; ISO 1600; F8 @ 1/1000. ISO 1600? Yes by choice. 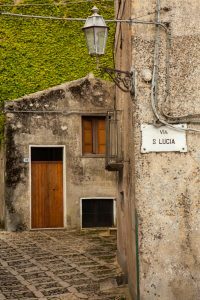 Erice is a very beautiful and small town at the top of a mountain-quaint and picturesque. The day that we were there, the whole town was engulfed in a thick cloud bank. No sun. Pretty much dark most of the time. So, to get a decent exposure, I had to bump the ISO up to 1600 to reduce the potential for motion blur and to be able to gain some depth of field. The “full frame” 5DMKII handles that ISO well. All of a sudden, as we were walking by this section of the town, the sun popped out. Hence the fast shutter speed. The perspective of the homes vs. the street sign interested me as well as the greenery on the wall. Cattedrale di Santa Maria del Fiore (Il Duomo di Firenze), Florence, Italy – September 2014 – Canon 7D; Canon 24mm-105mm lens @ 105mm; ISO 100; F1 @ 10s, on a tripod. 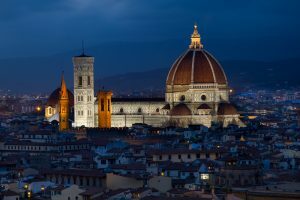 Il Duomo is the most famous and most iconic cathedral in Florence. I learned from research in preparation for the trip that one of the best shots of Il Duomo can be taken from Piazzale Michelangelo. So we walked from our B&B on the other side of Il Duomo through Florence, over the Ponte Vecchio, and up a steep hill to the Piazzale in plenty of time for the sunset. Joyce helped with carrying the tripod and some of the equipment. I chose a great spot and setup all of the equipment. I composed the shots and took various test shots. Unfortunately, the sun ducked behind a cloud bank, so no sunset this particular night. But, that did not take away from the beauty and splendor of the cathedral against the gentle shadows of the mountains in the background. A young newlywed couple from Singapore were taking pictures just to the right of me. Unfortunately the gentleman had not packed a tripod which was certainly necessary. So, I after I got the shots that I wanted, I offered, and he accepted, the use of my tripod. So, Joyce and I sat and enjoyed the views as he was able to get his shots of a lifetime. So when I visited in February of 2016, the castle was just a shell of its former shelf. Totally burned out, there was no roof and the floors where nearly all gone. The castle is located on a beautiful piece of property on the ocean with a gorgeous, empty beach. It is obvious that it was once a luxurious destination. As I wandered the grounds, I experienced an eerie feeling of ghosts past: the dried up pools and fountains, the old walks and archways, and the grass and bushes that had not been tended to in years. It was a brutally hot day as I took photos all around the property. Finally, seeking some shade, I climbed up the front stairs carefully to have a look. There was broken glass and debris everywhere from the fire. The image exhibited is looking through the front door of the castle straight back through several rooms, then out to the ocean. The shadows are created by the few remaining roof rafters. 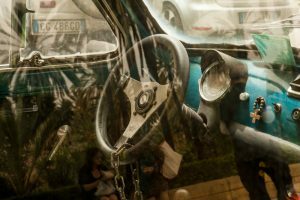 Fiat 500 (Cinquecento), Palermo, Sicily – May 2016 – Canon 5DMKII; Canon 24mm-105mm lens @ 70mm; ISO 800; F16 @ 1/125. As we often do, Joyce and I were wandering the streets of Palermo. As we were cutting through the parking lot of the local police station, we discovered an old Fiat 500 parked there. It was in rough shape but appeared to be drivable and did not look like it had been sitting in the parking spot for very long. I shot many images from different perspectives including from the ground, front, back, and sides. I even timed some of the images to include passers by. Then I looked in the windows. What an interesting treasure trove of objects, shapes and reflections! 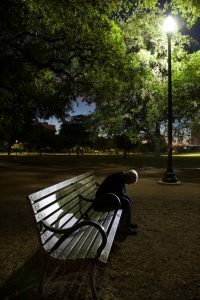 Did you discover the woman sitting on the park bench? There are 3 people reflected in the image. Take a look in the larger format of the gallery. blue letter “A”. So, I would first look for the letter “A” and then determine if it was blue enough – usually striking out. The creative approach is to find the blue, and then look for an “A” within the blue. Aha! Creativity. 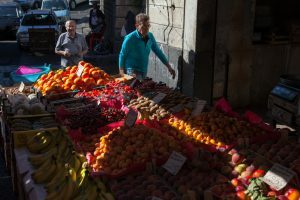 So, the Catania market was outdoors and the sun had already risen and was getting bright. Each vendor’s area was typically covered by a canopy of some sort. As the sun moved, interesting shafts of light were created along with corresponding shadows. the sun and the shafts were moving fast, so I had to work quickly. In this particular case, the shaft of light highlighted the fruit’s and vegetables. I wanted to make the image a bit more interesting so I setup the shot and waited for the right moment when the man was in a good spot. I then clicked the shutter. Camden, ME – August 2016 – Canon 5DMKII; Canon 70mm-200mm lens @ 70mm; ISO 100; F11 @ 1/160. The sunrise opportunity had come and gone. 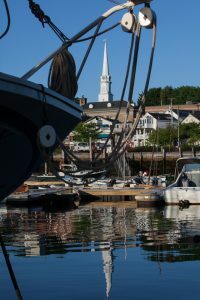 I had been shooting reflections in the water of downtown Camden including the church steeple from the harbor docks. The images were looking pretty good but they were like most of the post cards one would see in the local gift shops. I wanted something different. As I walked around thinking about my artist’s pallet, a “frame within a frame” opportunity presented itself, along with some nice shafts of light and shadows, and the reflection in the water. 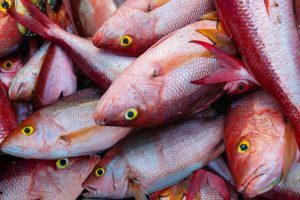 Oistins Fish Market, Barbados – January 2017 – Canon 5DMKII; Canon 24mm-105mm lens @ 50mm; ISO 400; F8 @ 1/80. The fish are red snappers. Now that that is out of the way… Barbados is a wonderful island to visit. When I am there, I will drive to a location and just walk around looking for great images and to make new friends with the locals. I have had a lot of success on both counts. Oistins is on the southern tip of the island. The town is known for it’s fish market and the Friday Night Oistin’s Fish Fry. The fish fry gets pretty crazy and certainly well worth the experience. I rose early one morning to take photos in the boat yard near the fish market and pier as the sun came up. After a while, I decided to check out the fish pier which extends about 300 – 400 yards in to the Caribbean. I heeded the “Do Not Enter” sign taking photos of the fishermen from a distance. Then one of the older locals told me that I could walk out on the pier. As I walked down, I noticed that one of the boats had just come in and the fishermen were unloading a bucket of fish. I looked in and a sea of red with yellow and black circles were starring blankly at me. I quickly took the shot and then the bucket was gone. The right side of my brain is getting better! I saw red with yellow and black circles and shapes pointing in the same direction. The George Ranch, Richmond, TX – April 2017 – Canon 5DMKII; Canon 24mm-105mm lens @ 60mm; ISO 1600; F4 @ 1/60. “The George Ranch Historical Park is an internationally-recognized living history site that authentically preserves and interprets the four-generational storyline of a remarkable Texas family beginning in 1824 and spanning more than 100 years. Just 30 miles southwest of downtown Houston, the Park is located on a 20,000-acre+ working ranch featuring historic homes, costumed interpreters and livestock. The Park aims to educate people of all ages about Texas history and the region’s unique heritage through programming that connects and inspires learners of all ages”. While attending a Joe Baraban photography workshop, we were fortunate enough to be able visit The George Ranch on an off-day when there were no tourists. Several of the costumed interpreters were present as well as 3 riders and horses from the Rodeo Sweethearts. I was able to capture lots of great, and unique, images the day. 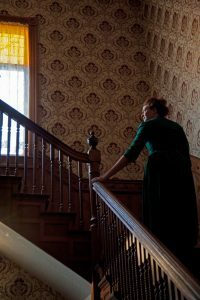 As we were getting ready to climb the stairs to the 2nd floor of the 1860s Ryan Prairie Home, Sarah preceded us and was bathed in the wonderful setting sun light coming through one of the windows. The highlights, lines and angles in the staircase, and the patterns of the wall paper help make this image an interesting portrait shot. 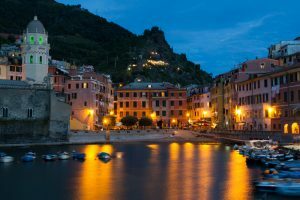 Vernazza, Cinque Terre, Italy – September 2014 – Canon 7D; Canon 17mm-40mm lens @ 29mm; ISO 100; F11 @ 13s, on a tripod. Joyce is a real trooper. She helps carry my gear. She follows me around and stops and waits while I get “THE” shot. At times, she is even a human tripod. She stood with me for over an hour on a concrete wall as the sun was setting and the temperature was dropping to grab this shot. Cinque Terre is an amazing area to visit. The buildings, the streets, the colors are also beautiful. After the sun went down in Vernazza, there were not many tourists left and the town was quite relaxed. We had dinner in an outdoor restaurant and I had fresh (not canned and salted) anchovies that were caught earlier in the day with just a touch of olive oil. What a delight! The gift in this image is the green light of the cathedral that is not noticeable until the sun sets as well as the yellow bands of light that highlight the ripples in the water. I misread the train schedule and we were fortunate enough to catch the only train headed back to our hotel that night after dinner. Riomaggiore, Cinque Terre, Italy – September 2014 – Canon 7D; Canon 24mm-105mm lens @ 70mm; ISO 400; F8 @ 1/2000. Riomaggiore was the first town that we visited in Cinque Terre. I was immediately in awe. As we walked up a quiet street, I noticed the ordered chaos of the houses and buildings as they rose with the hill. I found it interesting that even though they are all tightly nestled together, each building stands out on its own. The colors as well as the travelers walking the hill drew me to this composition. 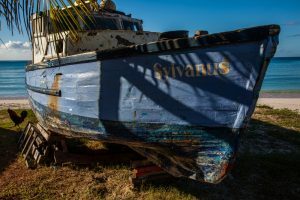 Oistins, Barbados – January 2017 – Canon 5DMKII; Canon 24mm-105mm lens @ 35mm; ISO 100; F11 @ 1/100. I had been shooting early one morning around the Oistins Fish Market, boat yard, and Fish Fry area. I then wandered down the beach and came across this boat on blocks. 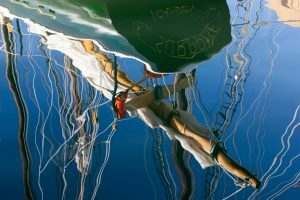 I was drawn to the various shades of blue in the boat as well as the ocean and the sky, the bars of shadows, and the texture in the hull. Chickens had been walking around all morning and I was fortunate that one of them decided to stroll by at the most opportune moment creating a great silhouette. Got to be ready for the unexpected! Aci Trezza, Sicily – May 2016 – Canon 5DMKII; Canon 24mm-105mm lens @ 47mm; ISO 100; F22 @ 1/4 on a tripod. 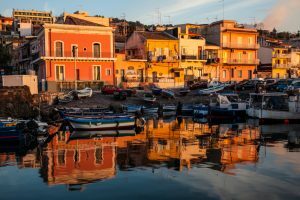 Aci Trezza is a small fishing village in southern Sicily not too far from Mt. Etna. The shoreline is very beautiful with small islands just off shore. We had been shooting the sunrise, around the fishermen and around the boatyard. At one point, I decided to walk out on a cement wall that encircled a small harbor area. I was facing the ocean and the sunrise looking for my next shot. I turned around and bang, there was this most amazing scene of the town glowing in the early morning sunlight and reflecting beautifully in the water of the harbor. I quickly set up my tripod because the sun moves fast and changes color fast. And I grabbed the shot. Lucky me. Bar Harbor, ME – September 2016 – Panasonic DMC – ZS100; zoomed to 18.2mm; ISO 400; F8 @ 1/160. Joyce and I love to spend Labor Day Weekend in Bar Harbor, ME and Acadia National Park. Sometimes we go by car and sometimes by motorcycle. In 2016, we went by car with our mountain bikes on the roof to ride the Acadia carriage trails. One of the useful habits among the many that I have learned from Joe Baraban is I carry a small mirrorless camera with me most of the time to grab quick shots when it is not practical to carry or take out the bigger cameras and lenses. This camera has a lot of great features and takes great photos. It is small and fits in my pocket but captures images as good as the bigger cameras. Why not use it all of the time? Well that is a different discussion for another time. So, we arrived at the Thornhedge Inn where we like to stay. 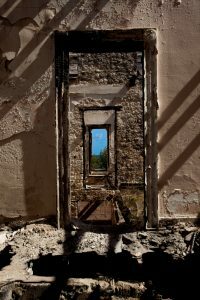 As we entered the room, I noticed bars of sun light and shadows shooting across the room on to the sofa and the walls opposite the windows. I dropped our luggage and shot a number of images but I just could not get excited about what I was getting. So, I then moved the fresh flowers that were in the room and positioned them in the sun light and shadows, and fired away. Much, much better. 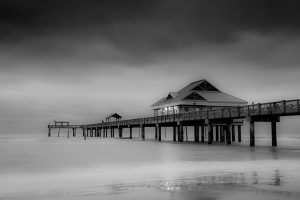 Pier 60, Clearwater Beach, FL – January 2010 – Canon 5DMKII; Canon 24mm-105mm lens @ 44mm; ISO 100; F22 @ 2.5 seconds on a tripod. Final image was converted to B&W. Clearwater Beach is ranked as one of the top beaches in the world. The water is wonderful and the sand is like sugar. On this particular morning, I had gotten up for a sunrise shoot. Unfortunately there was no sun and there was no rise. But, the reflections in the sand looked great. So, I set up the tripod and shot with a slow shutter speed which created the silky look of the water. All weather conditions are great opportunities for shooting! 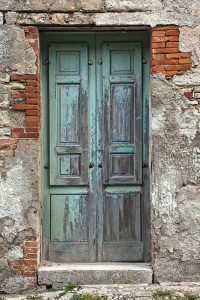 Door – Erice, Sicily – May 2016 – Canon 5DMKII; Canon 24mm-105mm lens @ 65mm; ISO 800; F8 @ 1/80. As mentioned above, Erice is a very beautiful and small town at the top of a mountain-quaint and picturesque. The day that we were there, the whole town was engulfed in a thick cloud bank. No sun. Pretty much dark most of the time. As we walked around, it was eerily quiet, with hardly no-one on the streets. At one point Joyce and I became lost in the thick fog. As we continued along, we say this door. Not sure what it went to. It surely had been around for many moons and weathered many foggy days and nights. The green of the door jumped out in the gloom.